Add an extra touch of romantic ambience, swing and enchantment to the occasion. Whether it be a relaxed garden party or a grand wedding, a solemn piece for a ceremony or some light background music during a meal or reception, Rosie and Jo can cater to your every musical wish. 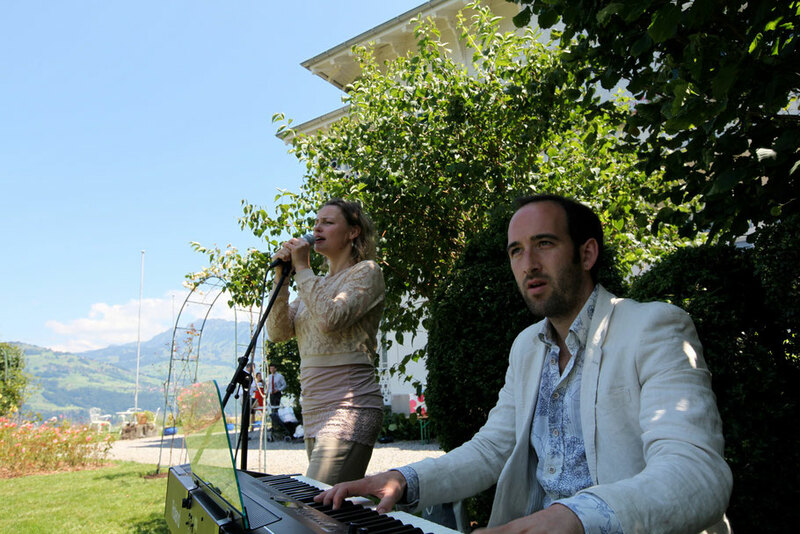 With degrees from the Conservatoire, this experienced singer and pianist duo will bring your musical requirements to life so as to ensure your occasion is a truly memorable experience. An extensive and varied repertoire of Bossa Novas, Jazz standards and ballads, soul classics and favourites from the 20s and 30s. The duo also perform contemporary hits and if you wish, they can surprise your guests with a music-and-theatre performance. ﻿Rosie & Jo made our party complete! They were lovely and spontaneous! Their music “glamorized” the outside part of our wedding day with a romantic and jolly atmosphere as people enjoyed listening to or even dancing along! Thanks alot for the joy and fantastic memories! Rosie & Jo was simply perfect. They played wonderful music for our celebration. The music was high quality and sophisticated but at the same time it created the feel good atmosphere we were hoping for. They have an awesome presence on stage and they also did nice background entertainment. They understood well what we like and they are very flexible.